Learn how to make a photo look old and worn in Photoshop. We will create a realistic vintage photo effect using grunge textures and gradient maps for color toning. If you are looking for fast results you can try the vintage Photoshop action. 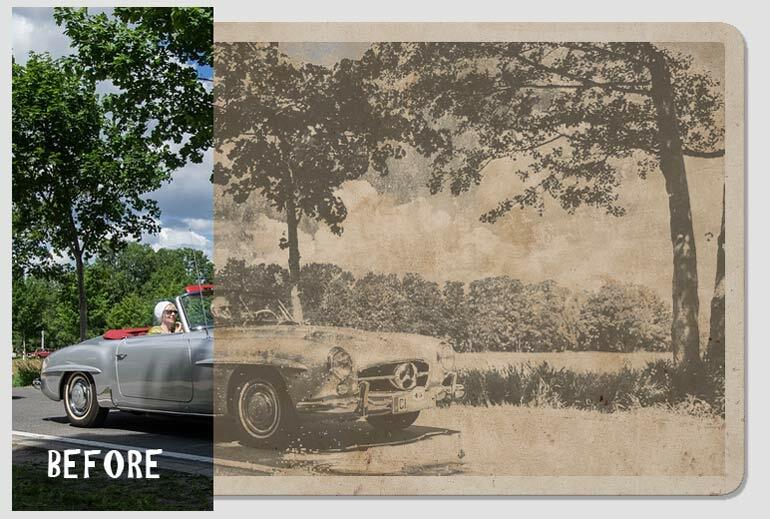 Create an old photo look with scratches, torn photo effect in just a few minutes. Learn how to make a photo look old and worn in Adobe Photoshop from this quick tutorial. Add the Retro Photo in a new layer. Copy the Grunge Texture in a new layer above the Retro Photo Layer. Set the blend mode to Overlay. Add a Gradient Map adjustment layer using these color tones: #2f2e2c (location 0%), #90805b (location 38%) and #fffdf5 (location 90%) Set the opacity of this layer to 87%. Add the Old Paper Texture in a new layer and set the opacity to 52%. Add a Layer Mask to the Old Paper layer. Duplicate the Retro Photo and move it in front of all the other layers. Click on the layer mask of the Old Paper layer. Go to Image > Apply Image. Go to Image > Adjustments > Levels to lighten the mask image. Download the Grunge Border PNG image and place it over the other layers. Set the blend mode to Screen. Press Control-I to invert the color of the border from black to white. Add again the Old Paper Texture in a new layer above all the other layers. Set the blend mode to Darker Color and the opacity to 65%. Some old photos have rounded corners. So here is how to make rounded corners in Photoshop. First select all the layers, right click and choose Merge Layers. Resize the new layer to around 98%. Keep the Control key pressed and click on the Layer Thumbnail to make a selection from layer. Go to Select > Refine Edge and make these settings. Press on the Add Layer Mask button to create the rounded corners. To make it look more like a thick paper, you can add a layer style with Drop Shadow, Bevel and Emboss and Inner Glow. This is the final result for the vintage old photo effect made in Photoshop using textures, brushes and adjustments. Vintage Photoshop action download for creating distressed old photo effects in just a few minutes. You can also add realistic torn photo effects. All the layers are intact and fully customizable. 1 comment(s) for "How to Make a Photo Look Old and Scratched in Photoshop"